Truly, this is the social media age. I learned my latest paper had been published when the journal tweeted the article. These are shrimp fast flexor motor neurons stained with a technique called backfilling or sometimes axonal filling. This technique can show you a lot. You can do colour coding, as shown here (cells filled from the left are yellow, those from the right are blue). Backfilling has one problem: it’s unpredictable. To figure out what neurons are connected to the nerve you’re filling, you have to build up a composite picture from a lot of fills. That’s why this image is so beautiful to me. It’s not just one fill, but two – left and right sides – and it is complete. Every neuron filled, so they are all there in one image. The only thing I could have wished for was to have the axons filling darker so they would be more visible. It’s no accident that this preparation appears in two figures and a movie in the supplemental information in the new paper: you can see a lot. The sad thing is that I’ve waited about eight years to share this image with you. Ieee. Here’s why. 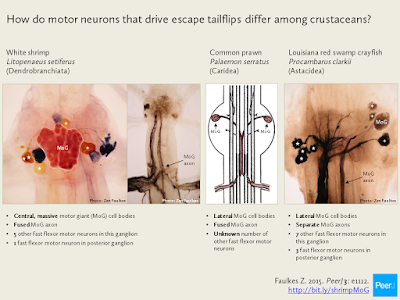 Based on work in my last post-doc, I’d published a paper on the fast flexor neurons of slipper lobsters (Faulkes 2004). Slipper lobsters didn’t have some of the giant neurons used for escape that had been so well described in crayfish. 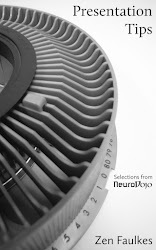 This lead me to looking for other variations in this set of neurons. Nobody had re-examined these shrimp motor neurons with newer techniques, even simple ones, so I went looking to see if there was anything different than crayfish, and to confirm that those anatomical features in the old papers were correct. This is often derided as a “fishing expedition” in grant reviews: you cast your line and see what you get. But the thing about fishing expeditions is that sometimes, you catch some fish. I caught some fish (so to speak). The biggest surprise was the massive MoG cell bodies in the white shrimp, which were completely unlike those in crayfish or other shrimp that had been looked at. I looked at those huge MoG cell bodies and thought, “Those look like a bunch of little cell bodies fused together.” When I went to the International Congress of Neuroethology in summer of 2007 and the Society for Integrative and Comparative Biology meeting in early 2008, most people I showed my pictures to either volunteered that idea without me suggesting that idea, or agreed that the idea of neuronal fusion was plausible. Additionally, the MoG cell bodies have an unusual appearance in the dendrobranchiate shrimp species Litopenaeus setiferus [Faulkes, 2007], suggesting that there is yet more diversity in the escape circuit to be described in the non-reptantian decapods. I think at this point, I had the fast flexors, and went back and did a few more fills on the extensor side to see if I was seeing similar patterns (fewer neurons than other species). Meanwhile, I picked up other projects, not the least of which was figuring out that weird things I saw in the nerve cord while looking at shrimp motor neurons were, in fact, larval tapeworms (Carreon et al. 2011, Carreon and Faulkes 2014). So during spring break this year, I reached that breaking point where I decided, “I want to submit this.” A flurry of work ensued, and I pushed the “submit” button on the afternoon of last weekday of the break. One of the benefits of waiting on a project for eight years is that entirely new publishing options open up for you: in this case, PeerJ. PeerJ didn’t exist when I’d started this project. I’d bought a PeerJ membership very early on, because I was very interested in the journal’s ideas, but hadn’t been able to take advantage of it before now. (And that was not for lack of trying! Anyone who suggests it’s easy to publish in open access journals is wrong.) That PeerJ doesn’t review for “significance” made it a logical place to submit, because my own gut instinct said that any journal that reviewed for “significance” would want evidence showing whether or not the MoGs were fused. Just like I did. Submitting to PeerJ was smooth, yet still challenging. The submission process for the figures and tables in particular is quite different from many other biological journals, so I messed things up in quite dumb ways. Sorry, reviewers and Fabiana (editor of the article). Once the manuscript was accepted, I was very impressed by how fast I got page proofs to check. It’s one of, if not they, quickest turnarounds I’ve had. It’s nice that something in the creation of this paper was fast. Of course, I still want to know if those neurons are fused. If anyone reading this has some ideas as to how to test it, I’d love to provide them with the shrimp you’d need! This are some beautiful pictures! The close-ups of a ganglion, with shady tree-like structures, are totally worthy of being framed and hung on a wall. Beautiful! Top ten for three months running! Tuesday Crustie: Release the Kraken!